Sensational diva, Raquel, has been confirmed to perform at this year’s Citi FM Singles Mingle at the Sajuna Beach Club. Raquel will be setting the event alight with her collection of hits come Saturday, March 1. Raquel, in an interview with Jessica Opare Saforo on the Traffic Avenue on 97.3 Citi FM, said that she always found satisfaction when she sings love songs and and promised to thrill patrons of Singles Mingle 2014 with only the best love songs from her repertoire. Singles Mingle seeks to bring together unmarried persons looking for the unique opportunity to bond with their partners, hang out with friends, meet other singles and get tips as to how to prepare for the ultimate, marriage. Speakers at this year’s event include Rev Bernard Arde-Acquah, who will be speaking on the topic “Understanding the four letter word, LOVE”. Kevin Amos Annan will speak on the topic “From Hello to I DO”. 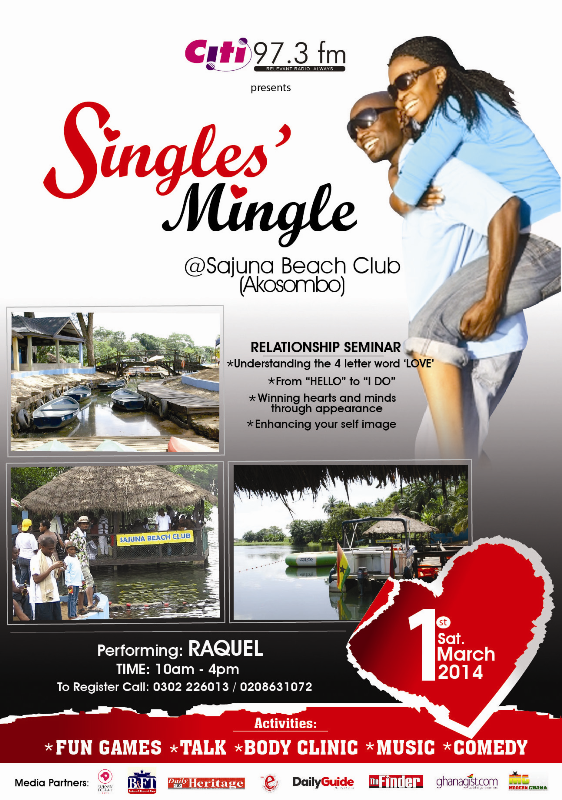 If you are single and ready to mingle, call 0302226013 and 0208631072 to register now and join the fun on Saturday 1st March 2014 at Sajuna Beach!!! Singles Mingle is powered by 97.3 Citi FM. Media partners are the Daily Heritage newspaper, the B&FT newspaper, the Daily Guide newspaper, the Finder newspaper, ghanagist.com, modernghana.com, ameyawdebrah.com, enewsgh.com and citifmonline.com. Raquel to perform at Citi FM Singles Mingle on March 1 0 out of 5 based on 0 ratings. 0 user reviews.